Introduction: Mary Harrell-Sesniak is a genealogist, author and editor with a strong technology background. In this guest blog post, Mary points out some lessons learned from an early obituary of the American folk-hero Daniel Boone. Did you know that another great American character, Daniel Boone, could have said something similar? He died at the age of 85 on 26 September 1820—but his death was widely reported in 1818! 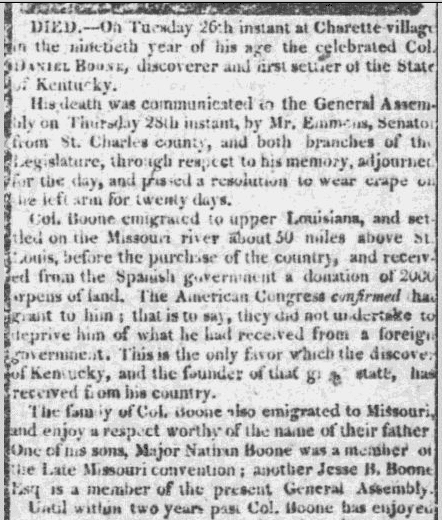 The first correct death notice for Daniel Boone that I found in GenealogyBank was published on 30 September 1820, four days after his death. 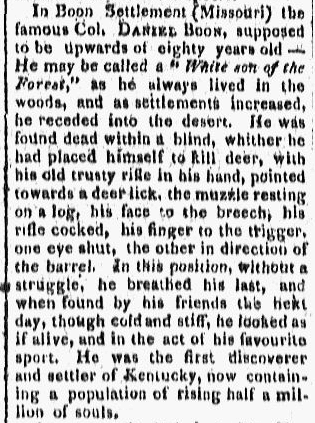 This was a more factual obituary than the one published in 1818, although the legendary image of Boone lying in a blind, with one eye shut and aiming his gun at a deer when death overcame him, still resonates. The conclusion of this obituary is fairly close to the truth: Boone remained impressively fit and active well into his later years. So the lesson from Daniel Boone’s obituary is this: check and double check. Don’t be satisfied with just the first obituary you find. Keep looking for more, since that first obituary may contain exaggerations or inaccuracies—although hopefully, unlike the case of Daniel, the first obituary of your ancestor wasn’t published two years before he or she died! Interested in finding out more about Daniel Boone, the quintessential American folk-hero, or his family history? A search of online family trees reveals that Daniel Boone was one of at least 11 children born to Squire and Sarah (Morgan) Boone. Daniel and Rebecca (Bryan) Boone also had a number of progeny, who in turn had many children. With such a large family, you can find numerous Boone relations in your genealogy searches. 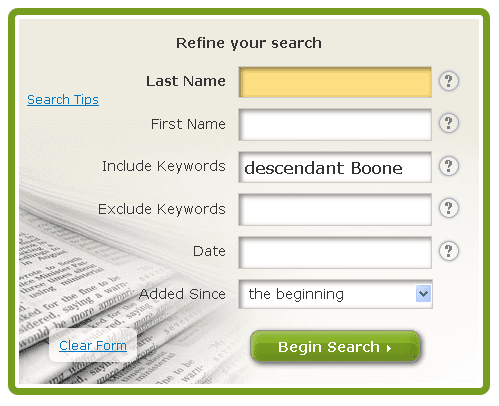 A general search of “Daniel Boone” in GenealogyBank will produce over 52,000 hits, so you may wish to limit your results by using keywords or date ranges. Ex-Mayor Levi D. Boone, of Chicago, died yesterday, aged seventy-three years. He was a descendant of Daniel Boone. YOAKUM, Tex., Dec. 19.—Died at his residence on East Hill J. B. Boone, aged 58 years, after a lingering illness. Mr. Boone came to this city about two years ago from Hillsboro, Tex. He was buried in the city cemetery at 4 p.m. to-day. Mr. Boone was a descendant of the illustrious Daniel Boone of Kentucky, was born and lived in Louisville, Ky., until sixteen years ago when he moved to Hillsboro. New Cambria, Mo., Jan. 26.—Fay Boone, an old time Mississippi river captain and a direct descendant of Daniel Boone, is dead, at the age of 89 years. Kansas City, Mo., May 21.—Linville Hayes, a descendant of Daniel Boone and a well known freighter in early days, when he directed the movement of large wagon trains to Salt Lake, New Mexico and Arizona, died today, aged 82 years. Daniel Boone was a Revolutionary War patriot. He probably did not wear a coonskin cap; it’s probable he wore black felt and sported a pigtail. Are You a Descendant of Daniel Boone? Are you related to Daniel Boone, or did your ancestors explore the frontier with him? We hope you’ll share your ancestral story by tweeting at http://twitter.com/#!/GenealogyBank or posting on our FaceBook page. The Boone Society, Inc. at https://www.facebook.com/BooneSociety. Boone Family History and Descendants: The First 5 Generations of the George Boone Family presented by The Boone Society, Inc. and reprinted at http://www.family-genealogy-online.com/little/boone.html, a family history website maintained by Pat and Jim Geary.